With Yum! Brands Inc. relocating five key C-suite executives to Plano, Texas, Louisville may become a show headquarters for the restaurant conglomerate, while employees in Texas are the ones actually steering the ship. “Whenever you move your C-level team … in effect you are moving your headquarters because that is where your heads are,” said Darren Tristano, president at Technomic, a Chicago-based restaurant industry research firm. Business First previously reported that Yum CEO Greg Creed, chief public affairs and global nutrition officer Jonathan Blum, chief legal officer Marc Kesselman, chief people officer Tracy Skeans, and a yet-to-be-named CFO will move to Plano, where Yum’s global operations team and its subsidiary Pizza Hut are located. Yum’s former CFO Pat Grismer resigned effective Feb. 19, Insider Louisville previously reported. 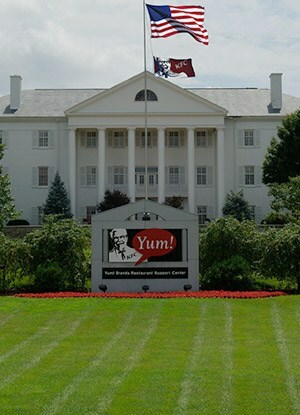 The company is adamant that Louisville is and will remain Yum’s home. Virginia Ferguson, a spokeswoman for Yum, told IL that none of its nearly 1,000 Yum and KFC U.S. employees are moving to Texas. “We are proud to be here,” Ferguson said. IL was scheduled to interview Blum this afternoon about the impending move; however, a few minutes before the appointment, IL was told he was suddenly pulled away and would be unavailable for comment. Ferguson forwarded along statements from Yum explaining the decision. She also noted that Yum has based its international operations in Texas since 1997, when the company spun-off from PepsiCo. Texas also is home to a number of other restaurant chains and restaurant-related businesses, including Pie Five Pizza, Dickey’s Barbecue Pit, Romano’s Macaroni Grill and Apex Restaurant Group. “Dallas is considered a very big restaurant town,” Tristano said, noting that many industry events and restaurant innovation happens there. It also is warm, has a large population and is somewhat centrally located. While Louisville city leaders often tout the city’s location and its proximity to other places, the truth is one of the few ways to get a direct flight is to be a box the United Parcel Service is shipping. The Louisville International Airport has fewer than 20 nonstop flights to cities in the United States. The Dallas/Fort Worth International Airport is a major transportation hub; it has nearly 50 nonstop flights to international cities and countless more within the continental United States. And Dallas is closer to China — where Yum will spin-off its operations this year — offering a nonstop flight to Beijing. Although Yum China will technically operate as its own company, Yum leaders will no doubt be keeping a close eye on how the company is faring in China’s sometimes volatile market. Already, Yum executives spend a good portion of their year abroad, according to the company. “Our business is a global business, and it makes sense,” she said. Tristano said he wouldn’t be surprised if Yum moved more jobs to Texas in the future, but the company also has good reason to remain in Louisville. If the company said it planned to move its headquarters but keep jobs in Louisville, it could end up with a retention problem. With its name plastered around the city (see KFC Yum! Center), Irvin said he is confident Yum will continue to maintain a large presence in Louisville. Still, the decision by Yum is an unusual one. Tristano could not think of any comparable examples, except possibly Tim Horton’s and Burger King. However, the quandary over where to headquarter those two restaurant chains is the result of their merger back in 2014. As of now, Tim Horton’s base of operations remains in Canada, while Burger King resides in the United States. Overall, Tristano said he thinks Yum is making good decisions to focus more globally and try to appeal to younger generations. You are currently browsing the archives for the Future Plans/Announcements category.